I am looking for a software program that is easy to use, not super complicated, cheap or preferably free, or at least a trial. I am very new to the Dollhouse world, but have been fascinated w/ tiny things, like my Bonsai trees, and "TINY" collection of anything miniature. Do you have any suggestions for some beginner level software? I am doing custom ones as I am doing some modern twists on the houses I plan on building, like working flat screen TV's, working home theaters, etc.. I need to design in wire chases or voids to run wire, electrical, and possibly working plumbing!! I thank you for your time and look forward from hearing from you in the near future and your site and it's info. 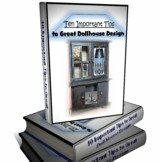 One of the best softwares on the market for designing dollhouses is Chief Architect Home Designer Essentials 2016. This software seems to be for house design but the principles are the same. Very easy to follow with a very knowledgeable staff ready to help with any question you may have. They have a channel on YouTube and lots of ideas for using their software on their website. You have to recalculate your measurements but just figure them out using our handy dollhouse measurement tool called Model Scale Calculator. Also you can find a link to this software at the bottom of any page on our dollhouse website. Thanks for stopping by with your comments Doug.